Absinthe Pernod Fils "Garanti Fabriqué en 1913"
This is the classic "benchmark" Pernod Fils with the labels overprinted "Fabriqué en 1913"
quantity were released 25 years later for export in 1938 with this special overprinted label. show the bottle still covered in the original cellar dust! documenting the history of these fascinating and magical wines, spirits and liqueurs. page, allowing you to enter your email address. It's free and you can unsubscribe at any time. cellars. We specialize in finding the unfindable, and helping to build extraordinary collections. To find out more, to send us your want list, or to discuss your individual requirements, please click here to contact us by email. of a cache found in the walled-up cellar of an old inn in Tasmania. 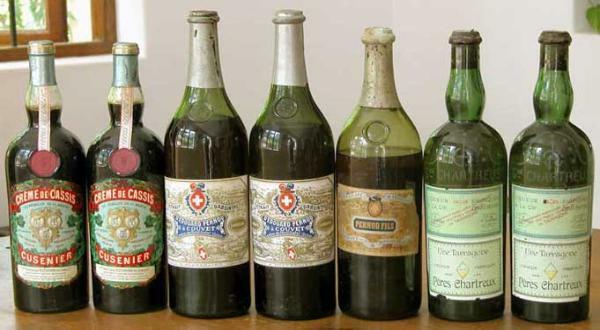 bottles, these rums were bottled around 1900-1910, and had likely 20 to 30 years in cask. arrangement, travel anywhere in the UK or Europe to view important collections or cellars. we do not offer valuations for these kinds of products. If you have something to sell, please click here to contact us by email. To order you must be at least 18 years old and be of legal drinking age in your jurisdiction. the attached link, your name will be added to our list. your email address. It's free and you can unsubscribe at any time. you safely remove even the oldest and most fragile corks. Please click here for details.